The U.S. has found a more deadly chemical weapon than any others, presumably lewisite, in experiments at Catholic University. April 6, the anniversary of the U.S. entry into the war, is set for the issuance of the third liberty bond. Bonds are crucial to government financing, the 16th amendment had passed in 1913, and income taxes were in their infancy. 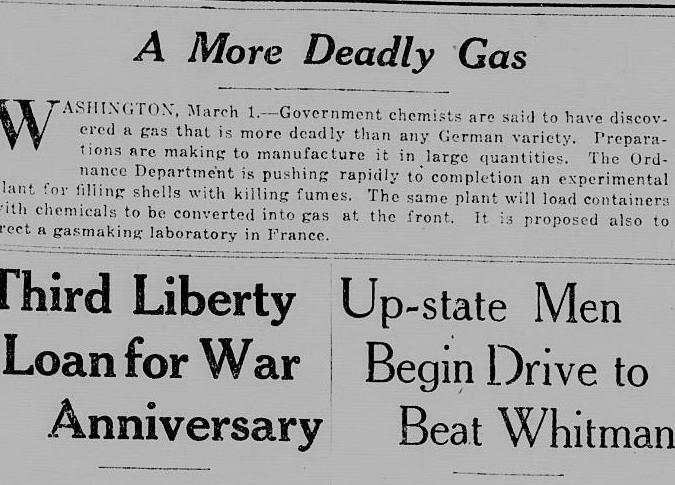 Source: "A More Deadly Gas," New York Tribune, March 2, 1918. Page 1, Column 3.